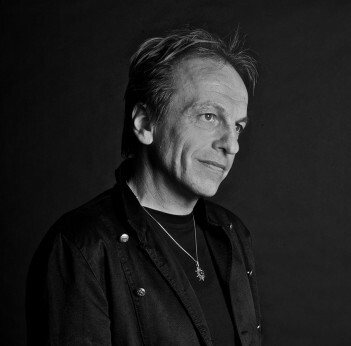 Andy Sears (Andreas Costas Paskis Christophus Sears), although best known as our charismatic lead vocalist from 1984 onwards, has had a long and varied musical journey! He began his eclectic musical career in 1975 at the age of 15, playing in a range of bands from metal and jazz rock to progressive rock. He joined Twelfth Night in November 1983, after answering an ad in the ‘Musicians Wanted’ section of Melody Maker, and toured the UK extensively with the band in the first half of 1984. Andy’s first album with the band ‘Art and Illusion’, was produced by Gil Norton (of Echo & The Bunnymen and Pixies fame), and was released on the independent Music for Nations label in October 1984, reaching Nº 84 in the UK album chart. After securing a major label deal with Virgin Records in 1985 the band went into the studio to begin recording the controversial album ‘Twelfth Night’, which was released in 1986. Two singles were taken off the album: Shame and Take A Look. Andy stepped down from the band in late 1986, disappointed by the lack of direction displayed by the label, and enrolled at the London School of Economics (LSE), where he gained a BSc in Social Psychology. After relocating to Spain in 1996 and working as an English teacher in Madrid, he made solo appearances at the Tiana Festival in Barcelona in 2004 and 2007. He was pivotal in re-uniting Twelfth Night in 2007. Andy Sears performed 90 gigs with Twelfth Night between December 1983 and November 1986. His extracurricular experience ranges from musical director for a ’60’s festival in Athens (featuring Neil Sedaka, Neil Diamond, and Bill Haley’s Comets), to session vocalist/arranger on Progressive Rock projects such as Galadriel’s ‘Calibrated Collision Course’ (Musea) on which he both wrote, arranged and sang all the backing vocals, including some cameo lead lines. More recently, he acted as vocal coach and lyric writer for Universal Records jazz/swing band No Reply. Andy’s solo tour as support to Pendragon in 2011 was his first in Europe and the UK, with his performance featuring some new solo material as well some Twelfth Night classics. His album ‘Souvenir’, which he describes as more of an insight into his future direction than a first solo album, was released to critical acclaim to coincide with this tour. As at Summer 2013 Andy is working on his first proper solo album, and has recently been performing (to great critical acclaim) with Clive Nolan’s Caamora Theatre Company in the new musical ‘Alchemy’. His portrayal of Victorian villain Sir Henry Jagman garnered unanimous rave reviews. Does a new career in musical theatre await?